This Land Cruiser is an East Coast weekend warrior, built to elevate every moment and pay tribute to the simplicity of another time. Whether our client wants to spend his weekends in the city limits, or out on a far-flung adventure, this FJ40 is ready to let the good times roll. There’s just something about the FJ40's steel body with all of those exposed bolts and sharp edges. No, they definitely don’t make them like this anymore. But yet, here it is, the legend in its prime, rolling on 31” BFGoodrich All-Terrain tires, and showing off its newly perfected metal jacket, fully-equipped to let the good times roll. 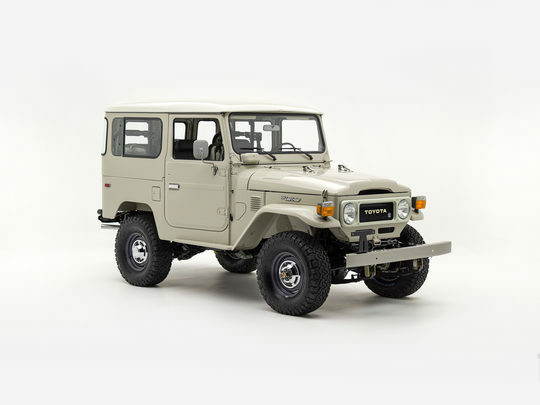 This FJ40 may be a weekend driver, but it is not a “fragile being.” Under the hood, you’ll find the Toyota 2F, a legendary engine with plenty of torque for those occasional rough and tumble adventures. 4-Speed transmission, upgraded suspension, revitalized 4-wheel drive, and power steering round out this classic ride, giving it a capable, yet comfortable edge over the original. Open the door to this classic Land Cruiser and you’re greeted with a blend of classic looks and modern comfort. The cabin has been reupholstered in gray vinyl - a durable marine-grade material that’s easy to clean and easy on the eyes. Up front, the retro dashboard brings back that old-school look with its familiar array of knobs and gauges. For comfort and entertainment, this beast has been equipped with climate control and a built-in audio system that’s iPhone- Bluetooth- and SiriusXM- ready. In other words, the next song is driver’s choice.